Whether it's injected, snorted, or smoked, methamphetamine is a highly addictive drug that affects the brain and central nervous system. Methamphetamine increase levels of the neurotransmitter dopamine, which stimulates brain cells, enhancing mood and body movement. When methamphetamine is injected or smoked it immediately produces an intensely pleasurable sensation known as a "rush" or a "flash." It does so by releasing high levels of dopamine in the brain. Snorting methamphetamine produces a euphoric sensation, but not a rush. Even when taken in small amounts, methamphetamine can cause increased wakefulness and physical activity. Often, people are too active to remember to eat and a decreased appetite is common. Physically, meth can increase respiration, heart rate, and blood pressure. It can cause hyperthermia (heat stroke) and an irregular heartbeat. There is also the potential for cardiovascular collapse. 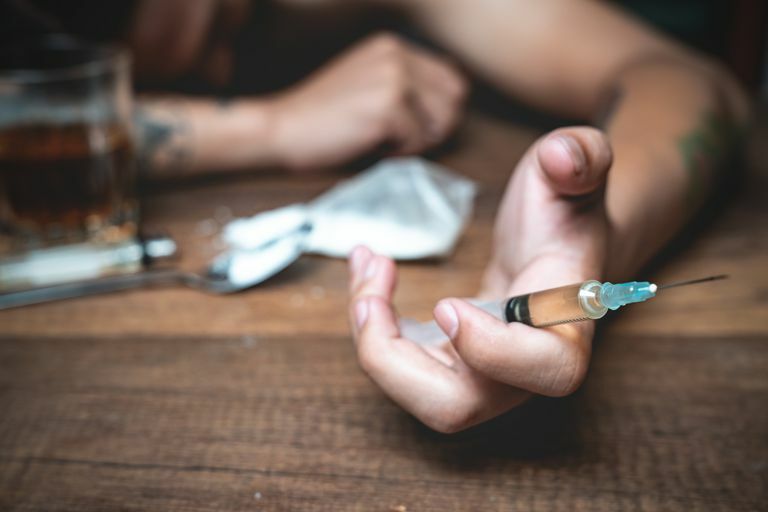 Other effects of meth use on the central nervous system can produce symptoms like irritability, confusion, anxiety, paranoia, and aggressiveness. Some users also suffer from prolonged insomnia and tremors. Hyperthermia and convulsions can be fatal. Methamphetamine can also cause irreversible damage to the blood vessels in the brain. This may result in a stroke. The long-term use of methamphetamine can cause damage to the brain similar to that caused by Alzheimer's disease, stroke, and epilepsy. This brain damage lingers for months even after the user stops using. Methamphetamine abuse can produce extreme anorexia. Even over a short period of use, methamphetamine can cause drastic changes in the appearance of the user. What Is an Overdose Like? Unlike other drugs, a methamphetamine overdose gives no immediate signs to users. Users can take a lethal dose and not immediately realize that they have just done so. An overdose results in a rapid onset of physiological deterioration, eventually leading to a heart attack or stroke. Because of the rapid onset, death occurs suddenly and unexpectedly. A meth overdose produces profuse sweating, rapid breathing, increased heart rate, and dilated pupils. A person who has overdosed on meth will have a high temperature, kidney failure, and cardiovascular collapse. The truly scary part is that it will all happen very quickly. Methamphetamine is highly addictive and users become physically dependent upon the drug quickly. Meth, like amphetamine, produces a rapid pleasurable feeling, which is followed by feelings of depression and irritability when the drug wears off. Users will seek and use more methamphetamine in order to get back to that state of pleasure or to just feel "normal" again. This results in a physical dependence on the drug and is a never-ending cycle for the majority of users until serious treatment is sought. Do you think you may need treatment for drug abuse? Take the drug abuse treatment screening quiz to find out. The withdrawal from a drug like meth is not easy and is filled with days or weeks of many symptoms. People who stop using methamphetamine experience irritability, depression, fearfulness, and loss of energy. Possibly the hardest to overcome, however, is the extreme craving for the drug. Meth withdrawal also results in physical symptoms like shaking or tremors, nausea, palpitations, sweating, hyperventilation, and increased appetite. People withdrawing from methamphetamine can alternate from wanting to sleep all the time, to not being able to sleep. Withdrawal symptoms can last for several weeks. National Institute on Drug Abuse. Methamphetamine. 2013.